S-train and bus: 90- 100 min. S-train, line C, "spor" (track) 9 or 10, to Klampenborg. 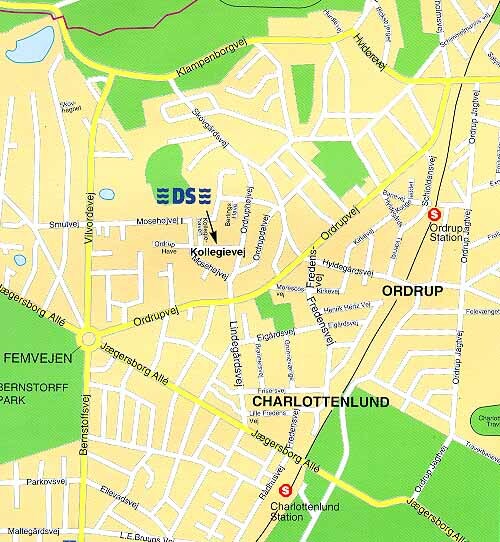 Get off at Charlottenlund Station or Ordrup Station. S-train, lines B and B+, "spor" (track) 9 or 10, to Holte. Get off at Bernstorffsvej Station and take bus no. 185 to Klampenborg. Get off the bus just before Lindegårdsvej and walk to Kollegievej 6, approx. 300 m.
Or get off at Gentofte Station and take bus no. 176 to Skovshoved. Get off the bus at Fredensvej and walk to Kollegievej 6, approx. 1600 m.
Bus: At Nørreport Station take bus no. 185 to Klampenborg. 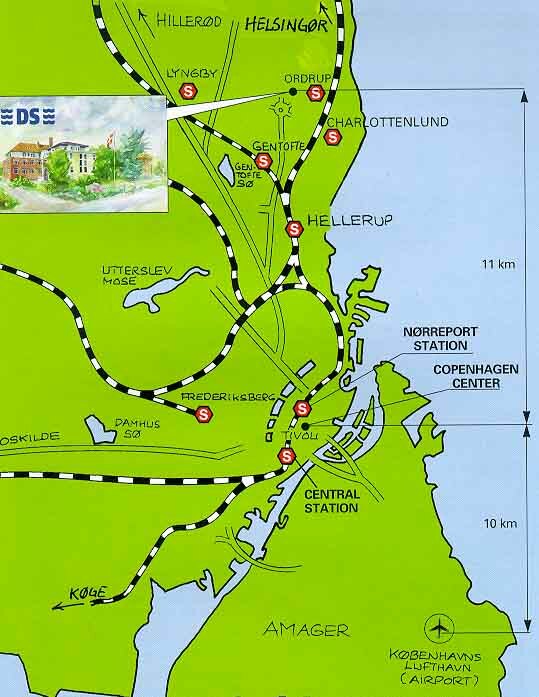 Car: Drive towards Helsingør and towards route  - follow Nørre Alle - Lyngbyvej, and take the first exit no. , follow Bernstorffsvej to the roundabout Femvejen, leave this via 2nd road Ordrupvej on your right , follow this until 1st traffic light. Turn left at Ordruphøjvej, and 2nd left again at Kollegievej. Car: Drive via highway E47 and E55, take exit <17> to Jaegersborgvej, Gentofte. Turn left and follow Jægersborgvej until 1st traffic light. Turn left and follow Jægersborg Alle to the roundabout Femvejen. Leave this via third road Ordrupvej, follow this until 1st traffic light. Turn left at Ordruphøjvej, and 2nd left again at Kollegievej. Car: Drive via highway E47 and E55, take exit  to Jægersborgvej, Gentofte. Turn right and follow Jærgersborgvej until 1st traffic light. Turn left and follow Jægersborg Alle to the roundabout Femvejen. Leave this via third road Ordrupvej, follow this until 1st traffic light. Turn left at Ordruphøjvej, and 2nd left again at Kollegievej. Purchase either a 4-zone single ticket or a blue card with 10 trips and punch twice in the automate. Bus drivers sell bus tickets, train tickets are sold at the station, but tickets are valid in both buses and S-trains. When changing buses/trains you only have to show the ticket to the driver. The ticket is valid for 1 hour and a half within a 4-zone limit with two punches.